As soon as we crossed the border from Germany into the Netherlands, the rain stopped, the clouds parted and the sun began to shine. I kid you not. Another case of real life imitating [bad] art, as in dumb, cliche-filled movies. Nearly 300 kilometers of rain, fog, and grey skies behind us in Germany, and two hundred ahead of us on the way to Brugge, Belgium, but the rest of the trip would be mostly pleasant. One of the few reasons other than the Parternin herself that I stay in Europe is for the chance to pop across borders and do things like this. We haven't done much of this in the past year, as she has been working long hours while I was playing long hours. It was indeed time for a change of Continental scenery. As the drive became less frightening and as the radio dial filled with dutch voices, the Partnerin dozed off. She awoke somewhere around Brussels, where I had tuned to a french-language station. "Finally, something we can both understand." I have some dutch in my blood, and parts of the language come back to me when I pay attention. It's all just noise to her. We both do french, however. One can't go to Belgium without eating a few frites. The scene here was precious. As I ordered my Pommes from the dutch-speaking and very disorganized kid behind the counter, a woman started ordering 7 burgers of various sorts in french. The kid spoke no french, which kind of took both me and the lady by surprise, me because I thought that the locals were mostly bilingual. The woman, of course, spoke no dutch. She stood there for a moment expressing her disbelief with words to the effect of, "We are all one country, after all." I guess she assumed that it was requisite for all in Belgium to speak french, and not necessarily the other way around. The european branch of my mother's family straddles the Netherlands-Belgium border, placing us squarely in the dutch camp, but most of my relatives speak both languages. A surprising number of the locals do not. So we translated for them. At first she was grateful, but then she realized that I was not a local. "Where are you from?" she asked. I told her "Franc-a-fort" ... We are speaking in french after all, ;) A little humor there, completely lost on her. "But you do not sound German!" "No, I am American," I replied. Now she was truly puzzled, because like most Europeans she has been led to believe that Americans don't do languages (actually had one use that phrase with me once). There is a delicious irony there ... Europeans hate it when Americans do "their" languages better than they themselves can. But the title of this post is Delicious cliche ... 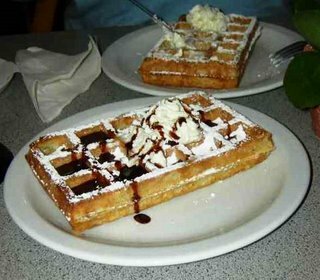 Speaking of delicious cliche's, we also had belgian waffels, pictured above. 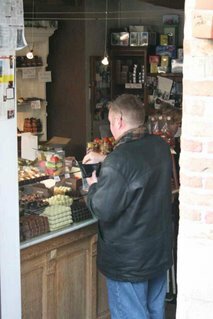 I also did some chocolates too, as captured by the Partnerin here as I fumble for my cash to pay for my stash of truffels, etc. If I lost a kylie over the summer, I think I gained half of a kylie back this weekend. We went to Brugge after the Partnerin found one of those Tchibo travel specials offering a Medieval Spectacle which is staged in an old church there. She has tried several times to book the Tchibo specials, but they are almost always sold out. This time we got lucky. 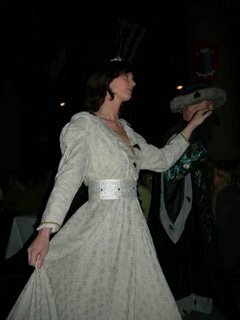 The Medieval Spectacle is is a feast set in 1468, where you are the guests of Charles the Bold and Margaret of York at their wedding feast. As advertised, there was plenty of food, drink, and entertainment. What there was not plenty of was parking. We ended up parking about a kilometer away, but it was just as well as I partook in plenty of food and drink (the Partnerin was the designated driver of her own volition I might add). When we first arrived, one of the ladies in waiting showed us to the table and explained the routine to us in English, much to the consternation of our table-mates. The man across from me finally asked, "Are you American?" The Partnerin told him I am American but can speak German and that she is German ... you could almost see the look of relief on his face. He replied in German that he and his wife could both do german or spanish, but she could not do english. I joked that I could do mexican or puerto rican, and that was as close to spanish as I could get. No laughs. Not so funny in retrospect, unless you have lived in New York. The Wife looked anything but spanish. I placed here somewhere in the middle of Poland. Later on, when the MC was saying a quick phrase in Russian, I translated for the Partnerin and our table mates were curious. Then the Wife sneezed and I wished her "Nostrovye," which my Polish intern had assured me is how the Poles bless one another after sneezing in Polish. She thanked me in polish, so the guess was right. How spanish entered that picture must have been an interesting story. The feast was advertised as "semi-buffet." We both wondered what that meant. At first I thought it might mean that some things were served while others were go-fetch-for-yourself. It turns out that "semi-buffet" means they bring big quantities to the table and then the table-mates divvy it up for themselves. 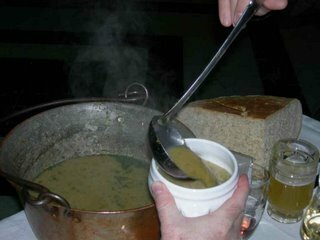 Here you see my table-mate dishing up my soup. What you also see in the background is the huge hunk of bread that we had to divvy without the benefit of big knives. A quick joke about what it used to mean about breaking bread, and then we tore off what we wanted. While we were negotiating the finer aspects of Medieval dining (we did have modern cutlery, so it really wasn't so bad for the Partnerin and her new-found friends ... 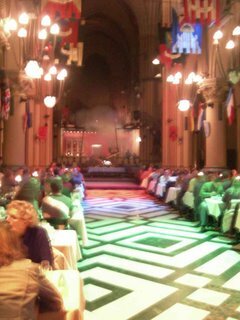 I'm a barbarian at heart, so it was a step up to have a seat, much less cutlery)., the falconers were giving a show. At one point the wingtip of one of the birds (a falcon, an eagle, and an owl) went whistling through my hair. The Partnerin jumped, but I kind of shrugged it off with, "There's something a health department in the US would never stand for." The falconers were letting the birds fly directly over the heads of the diners. They were also letting selected members of the audience take turns at letting the birds land on their gloved hands. In fact, there was a lot of audience participation in the event, and not just in the eating. At one point, the Knight appointed to represent our table in the combat came to brief us on what we were expected to do to support him. He asked the table what language we spoke ... German was the answer from three of the four, and he looked at me and said, "Do you also speak german?" to which I replied, "Un peu," and received a very irritated "Alors!" which I took as being his version of "give me a break!" I had hoped that the very tall and pretty Lady Margaret of York would pick me for seomthing but she went for my table mate, who had the chance to shoot a cross bow for a small prize. Not really much of a cross-bow ... don't want to seriously arm us amateurs. I didn't get permission to publish the photo, so I hope they'll take the free advertising here in exchange for permission. She was a real-life Snow White. Did I mention that there was plenty to eat and drink? Well, that went on with a number of other entertainment events, and then we spilled out onto the streets of Brugge just after 11 p.m. The town itself is a happening little scene on a Saturday evening. And after all of that, you can find your way to a waffel stand on the corner. Time to go hit the cross-trainer. Okay, next trip you and Parternin must adopt me and take me along! Between the waffles and the chocolate, I might have even learned to speak french! Sounds like a great trip. Can I ask? What was on the frittes? It really does freak folks out here when "Amis" "do languages." I had a similar experience to yours many years ago (we're talking more than 10 years ago). My sister-in-law's former boyfriend's parents were from Hungary. One weekend, a cousin of his came to Germany from Hungary to visit. We were all in the car having just been introduced to each other. The cousin didn't speak English and, at the time, my German was very poor (some would argue that it's still poor, and I would agree, but I digress...). So, I took a stab and started speaking Russian with his cousin. Everyone was amazed -- especially my wife, who never knew I "spoke" Russian (using the term "spoke" very loosely here, lest I ever meet your Smokin' Hot Russian -- that was many years ago, after all). Nowadays, it's much simpler. Everyone speaks English -- except for the French, of course. @maribeth: I would guess that is mayonnaise on the fries. That's something I never learned to "appreciate." Looks pretty disgusting, doesn't it? I don't even like that much ketchup on my fries. "Would you like some fries with your mayonnaise?" Btw, sorry for the anonymous posts. My Blogger login seems to be AWOL right now. Mayo ... lots of mayo. I fear I may never be able to return to the US at this rate. Wow, you sure know how to party! I'm exhausted (and hungry) just reading all that. I think you need to get a t-shirt with "I'm only here for the waffles" on it. 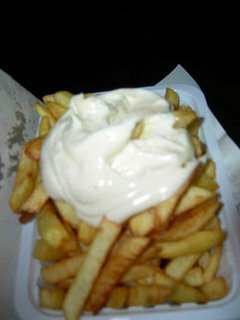 So the Belgians only do mayo and forget the ketchup? I'm cross-training right along with you - three days in a row now on the eliptical torture machine.